Alexander Graham Bell ('Graham' pronounced /ˈɡreɪ.əm/) (March 3, 1847 – August 2, 1922) was a Scottish-born[N 2] scientist, inventor, engineer, and innovator who is credited with inventing and patenting the first practical telephone. He also founded the American Telephone and Telegraph Company (AT&T) in 1885. 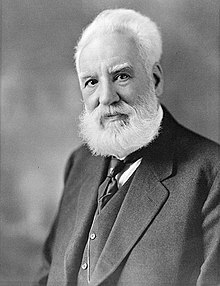 Alexander Bell was born in Edinburgh, Scotland, on March 3, 1847. The family home was at South Charlotte Street, and has a stone inscription marking it as Alexander Graham Bell's birthplace. He had two brothers: Melville James Bell (1845–70) and Edward Charles Bell (1848–67), both of whom would die of tuberculosis. His father was Professor Alexander Melville Bell, a phonetician, and his mother was Eliza Grace (née Symonds). Born as just "Alexander Bell", at age 10, he made a plea to his father to have a middle name like his two brothers. [N 5] For his 11th birthday, his father acquiesced and allowed him to adopt the name "Graham", chosen out of respect for Alexander Graham, a Canadian being treated by his father who had become a family friend. To close relatives and friends he remained "Aleck". In 1874, telegraph message traffic was rapidly expanding and in the words of Western Union President William Orton, had become "the nervous system of commerce". Antonio Meucci sent a telephone model and technical details to the Western Union telegraph company but failed to win a meeting with executives. When he asked for his materials to be returned, in 1874, he was told they had been lost. Two years later Bell, who shared a laboratory with Meucci, filed a patent for a telephone, became a celebrity and made a lucrative deal with Western Union. Meucci sued and was nearing victory—the supreme court agreed to hear the case and fraud charges were initiated against Bell—when the Florentine died in 1889. The legal action died with him. Orton had contracted with inventors Thomas Edison and Elisha Gray to find a way to send multiple telegraph messages on each telegraph line to avoid the great cost of constructing new lines. When Bell mentioned to Gardiner Hubbard and Thomas Sanders that he was working on a method of sending multiple tones on a telegraph wire using a multi-reed device, the two wealthy patrons began to financially support Bell's experiments. Patent matters would be handled by Hubbard's patent attorney, Anthony Pollok. The question of priority for the variable resistance feature of the telephone was raised by the examiner before he approved Bell's patent application. He told Bell that his claim for the variable resistance feature was also described in Gray's caveat. Bell pointed to a variable resistance device in his previous application in which he described a cup of mercury, not water. He had filed the mercury application at the patent office a year earlier on February 25, 1875, long before Elisha Gray described the water device. In addition, Gray abandoned his caveat, and because he did not contest Bell's priority, the examiner approved Bell's patent on March 3, 1876. Gray had reinvented the variable resistance telephone, but Bell was the first to write down the idea and the first to test it in a telephone. The patent examiner, Zenas Fisk Wilber, later stated in an affidavit that he was an alcoholic who was much in debt to Bell's lawyer, Marcellus Bailey, with whom he had served in the Civil War. He claimed he showed Gray's patent caveat to Bailey. Wilber also claimed (after Bell arrived in Washington D.C. from Boston) that he showed Gray's caveat to Bell and that Bell paid him $100 (equivalent to $2,300 in 2018). Bell claimed they discussed the patent only in general terms, although in a letter to Gray, Bell admitted that he learned some of the technical details. Bell denied in an affidavit that he ever gave Wilber any money. Emperor Pedro II of Brazil was the first person to buy stock in Bell's company, the Bell Telephone Company. One of the first telephones in a private residence was installed in his palace in Petrópolis, his summer retreat forty miles (64 km) from Rio de Janeiro. During his world tour of 1910–11, Bell and Baldwin met with Forlanini in France. They had rides in the Forlanini hydrofoil boat over Lake Maggiore. Baldwin described it as being as smooth as flying. 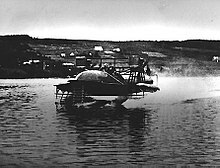 On returning to Baddeck, a number of initial concepts were built as experimental models, including the Dhonnas Beag (Scottish Gaelic for little devil), the first self-propelled Bell-Baldwin hydrofoil. The experimental boats were essentially proof-of-concept prototypes that culminated in the more substantial HD-4, powered by Renault engines. A top speed of 54 miles per hour (87 km/h) was achieved, with the hydrofoil exhibiting rapid acceleration, good stability, and steering, along with the ability to take waves without difficulty. In 1913, Dr. Bell hired Walter Pinaud, a Sydney yacht designer and builder as well as the proprietor of Pinaud's Yacht Yard in Westmount, Nova Scotia, to work on the pontoons of the HD-4. Pinaud soon took over the boatyard at Bell Laboratories on Beinn Bhreagh, Bell's estate near Baddeck, Nova Scotia. Pinaud's experience in boat-building enabled him to make useful design changes to the HD-4. After the First World War, work began again on the HD-4. Bell's report to the U.S. Navy permitted him to obtain two 350 horsepower (260 kilowatts) engines in July 1919. On September 9, 1919, the HD-4 set a world marine speed record of 70.86 miles per hour (114.04 kilometres per hour), a record which stood for ten years. The AEA's work progressed to heavier-than-air machines, applying their knowledge of kites to gliders. Moving to Hammondsport, the group then designed and built the Red Wing, framed in bamboo and covered in red silk and powered by a small air-cooled engine. On March 12, 1908, over Keuka Lake, the biplane lifted off on the first public flight in North America. [N 23][N 24] The innovations that were incorporated into this design included a cockpit enclosure and tail rudder (later variations on the original design would add ailerons as a means of control). One of the AEA's inventions, a practical wingtip form of the aileron, was to become a standard component on all aircraft. [N 25] The White Wing and June Bug were to follow and by the end of 1908, over 150 flights without mishap had been accomplished. However, the AEA had depleted its initial reserves and only a $15,000 grant from Mrs. Bell allowed it to continue with experiments. Lt. Selfridge had also become the first person killed in a powered heavier-than-air flight in a crash of the Wright Flyer at Fort Myer, Virginia, on September 17, 1908. 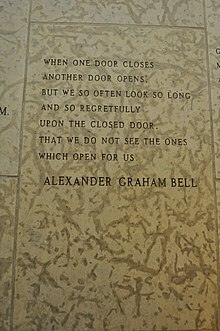 A quote by Alexander Graham Bell engraved in the stone wall within the Peace Chapel of the International Peace Garden (in Manitoba Canada and North Dakota, USA). 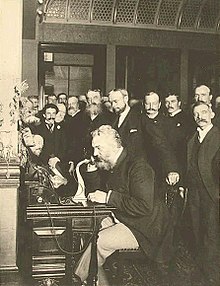 In 1880, Bell received the Volta Prize with a purse of 50,000 French francs (approximately US$270,000 in today's dollars) for the invention of the telephone from the French government. Among the luminaries who judged were Victor Hugo and Alexandre Dumas, fils. [better source needed] The Volta Prize was conceived by Napoleon III in 1852, and named in honor of Alessandro Volta, with Bell becoming the second recipient of the grand prize in its history. Since Bell was becoming increasingly affluent, he used his prize money to create endowment funds (the 'Volta Fund') and institutions in and around the United States capital of Washington, D.C.. These included the prestigious 'Volta Laboratory Association' (1880), also known as the Volta Laboratory and as the 'Alexander Graham Bell Laboratory', and which eventually led to the Volta Bureau (1887) as a center for studies on deafness which is still in operation in Georgetown, Washington, D.C. The Volta Laboratory became an experimental facility devoted to scientific discovery, and the very next year it improved Edison's phonograph by substituting wax for tinfoil as the recording medium and incising the recording rather than indenting it, key upgrades that Edison himself later adopted. The laboratory was also the site where he and his associate invented his "proudest achievement", "the photophone", the "optical telephone" which presaged fibre optical telecommunications while the Volta Bureau would later evolve into the Alexander Graham Bell Association for the Deaf and Hard of Hearing (the AG Bell), a leading center for the research and pedagogy of deafness. The bel (B) and the smaller decibel (dB) are units of measurement of sound pressure level (SPL) invented by Bell Labs and named after him. [N 27] Since 1976, the IEEE's Alexander Graham Bell Medal has been awarded to honor outstanding contributions in the field of telecommunications. Biography aired an episode Alexander Graham Bell: Voice of Invention on August 6, 1996. ^ [Is the following a quote from the source referenced? :] While Bell worked in many scientific, technical, professional and social capacities throughout his life he would remain fondest of his earliest vocation. To the end of his days, when discussing himself, Bell would always add with pride "I am a teacher of the deaf". ^ Bell was a British subject for most of his early life. When he moved to Canada in 1870, Canadian and British citizenship were functionally identical, with Canadian citizenship only becoming a formal classification in 1910. He applied for American citizenship after 1877, gained it in 1882, and referred to himself as an American citizen from that point on. Quote from Bell speaking to his wife: "you are a citizen because you can't help it – you were born one, but I chose to be one." Aside from Bell's own view of his citizenship, many, if not most Canadians considered him also as one of theirs as evidenced in an address by the Governor General of Canada. On October 24, 1917, in Brantford, Ontario, the Governor General spoke at the unveiling of the Bell Telephone Memorial to an audience numbering in the thousands, saying: "Dr. Bell is to be congratulated upon being able to receive the recognition of his fellow citizens and fellow countrymen". ^ From Black (1997), p. 18: "He thought he could harness the new electronic technology by creating a machine with a transmitter and receiver that would send sounds telegraphically to help people hear." ^ After Bell's death his wife Mabel wrote to John J. Carty, an AT&T vice-president, and commented on her husband's reluctance to have a phone in his study, saying "[of the statements in the newspapers] ...publishing of Mr. Bell's dislike of the telephone. Of course, he never had one in his study. That was where he went when he wanted to be alone with his thoughts and his work. The telephone, of course, means intrusion by the outside world. And the little difficulties and delays often attending the establishment of conversation... did irritate him, so that as a rule he preferred having others send and receive messages. But all really important business over the telephone he transacted himself. There are few private houses more completely equipped with telephones than ours... and there was nothing that Mr. Bell was more particular about than our telephone service... We never could have come here [to Beinn Bhreagh] in the first place or continued here, but for the telephone which kept us in close touch with doctors and neighbors and the regular telegraph office... Mr. Bell did like to say in fun, "Why did I ever invent the Telephone," but no one had a higher appreciation of its indispensableness or used it more freely when need was—either personally or by deputy —and he was really tremendously proud of it and all it was accomplishing." ^ Bell typically signed his name in full on his correspondence. ^ Helmholtz's The Sensations of Tone is credited with inspiring Bell, at the age of 23, to further his studies of electricity and electromagnetism. ^ The family pet was given to his brother's family. ^ The estate, dating from 1858, is in the present day located at 94 Tutela Heights Road, Brantford, and is now known as the "Bell Homestead", and formally as the Bell Homestead National Historic Site of Canada. It received its historical designation from the Government of Canada on June 1, 1996. ^ Bell would later write that he had come to Canada a "dying man". ^ Bell was thrilled at his recognition by the Six Nations Reserve and throughout his life would launch into a Mohawk war dance when he was excited. ^ In later years, Bell described the invention of the telephone and linked it to his "dreaming place". ^ Eber (1991), p. 43 claimed that Mabel suffered scarlet fever in New York "...shortly before her fifth birthday..."; however, Toward (1984) provided a detailed chronology of the event claiming "... shortly after their arrival in New York [in January 1863]" when Mabel would have been at least five years and five weeks of age. Mabel's exact age when she became deaf would later play a part in the debate on the effectiveness of manual versus oral education for deaf children, as children who are older at the onset of deafness retain greater vocalization skills and are thus more successful in oral education programs. Some of the debate centred on whether Mabel had to relearn oral speech from scratch, or whether she never lost it. ^ From Alexander Graham Bell (1979), p. 8: "Brantford is justified in calling herself 'The Telephone City' because the telephone originated there. It was invented in Brantford at Tutela Heights in the summer of 1874." ^ Hubbard's financial support to the research efforts fell far short of the funds needed, necessitating Bell to continue teaching while conducting his experiments. Bell was so short of funds at times that he had to borrow money from his own employee, Thomas Watson. Bell also sought an additional CAD$150 from the former Premier of Canada, George Brown, in exchange for 50% of the patent rights in the British Empire (Brown later retracted his offer to patent the telephone in the U.K. for fear of being ridiculed). The Bell Patent Association, composed of Hubbard, Sanders and Bell and which would become the precursor of the Bell Telephone Company (and later, AT&T), would later assign an approximate 10% interest of its shares to Watson, in lieu of salary and for his earlier financial support to Bell while they worked together creating their first functional telephone. ^ A copy of a draft of the patent application is shown, described as "probably the most valuable patent ever." ^ Tomas Farley also writes that "Nearly every scholar agrees that Bell and Watson were the first to transmit intelligible speech by electrical means. Others transmitted a sound or a click or a buzz but our boys [Bell and Watson] were the first to transmit speech one could understand." ^ Many of the lawsuits became rancorous, with Elisha Gray becoming particularly bitter over Bell's ascendancy in the telephone debate, but Bell refused to launch a countersuit for libel. ^ Marian was born only days after Bell and his assistant Sumner Tainter had successfully tested their new wireless telecommunication invention at their Volta Laboratory, one which Bell would name as his greatest achievement. Bell was so ecstatic that he wanted to jointly name his new invention and his new daughter Photophone (Greek: "light–sound"), Bell wrote: "Only think!—Two babies in one week! Mabel's baby was light enough at birth but mine was LIGHT ITSELF! Mabel's baby screamed inarticulately but mine spoke with distinct enunciation from the first." Bell's suggested scientific name for their new infant daughter did not go over well with Marian's mother, Mabel Gardiner Hubbard Bell. ^ Under the direction of the Boston architects, Cabot, Everett & Mead, a Nova Scotia company, Rhodes, Curry & Company, carried out the actual construction. ^ In one memorable incident, the newly arrived Bells were walking down one of Baddeck's central streets when Bell peered into a storefront window and saw a frustrated shopkeeper fiddling with his problematic telephone. Bell quickly disassembled it and effected a repair, to the owner's amazement. When asked how he was able to do so Bell only needed to introduce himself. ^ Bell was inspired in part by Australian aeronautical engineer Lawrence Hargrave's work with man-carrying box kites. Hargrave declined to take patents on his inventions, similar to Bell's decision not to file patents on some of his inventions. Bell also chose maroon-colored silk as it would show up clearly against the light-colored sky in his photographic studies. ^ "Selfridge Aerodrome Sails Steadily for 319 feet (97 m)." Washington Post May 13, 1908. ^ At 25 to 30 Miles an Hour. First Public Trip of Heavier-than-air Car in America. Professor Alexander Graham Bell's New Machine, Built After Plans by Lieutenant Selfridge, Shown to Be Practicable by Flight Over Keuka Lake. Portion of Tail Gives Way, Bringing the Test to an End. Views of an Expert. Hammondsport, New York, March 12, 1908. ^ The aileron had been conceived of as early as 1868 by British inventor M.P.W. Boulton and was also created independently by Robert Esnault-Pelterie and several others. ^ The Charles Fleetford Sise Chapter of the Telephone Pioneers of America commissioned and dedicated the large bronze statue of Bell in the front portico of Brantford, Ontario's new Bell Telephone Building plant on June 17, 1949. Attending the formal ceremony were Bell's daughter, Mrs. Gillbert Grosvenor, Frederick Johnson, President of the Bell Telephone Company of Canada, T.N. Lacy, President of the Telephone Pioneers, and Brantford Mayor Walter J. Dowden. To each side of the portico facing the monument are the engraved inscriptions "In Grateful Recognition of the Inventor of the Telephone". Its dedication was broadcast live nationally by the Canadian Broadcasting Corporation. ^ The decibel is defined as one tenth of a bel. ^ In the last years of his life, as his final projects wound down, Bell and his wife, their extended family and friends, lived exclusively at their beloved Beinn Bhreagh. ^ From Bethune (2009), p. 119: "[his end came] at 2:00 am... His wife, Mabel, daughter Daisy, and son-in-law David Fairchild had gathered around him. His last view was of the moon rising above the mountain he loved". ^ Boileau, John (2004). Fastest in the World: The Saga of Canada's Revolutionary Hydrofoils. Halifax, Nova Scotia: Formac Publishing. p. 12. ISBN 978-0-88780-621-6. ^ "Particle Physics Resurrects Alexander Graham Bell's Voice". IEEE Spectrum. April 30, 2018. Retrieved May 10, 2018. ^ "The Bell Family". Bell Homestead National Historic Site. Retrieved September 27, 2013. ^ Gray 2006, p. 228. ^ Reville, F. Douglas (1920). History of the County of Brant: Illustrated With Fifty Half-Tones Taken From Miniatures And Photographs (PDF). Brantford, Ontario: Brantford Historical Society & Hurley Printing. p. 319. Retrieved May 4, 2012. ^ Bruce, Robert V. (1990). Bell: Alexander Bell and the Conquest of Solitude. Ithaca, New York: Cornell University Press. p. 419. ISBN 978-0-8014-9691-2. ^ MacLeod, Elizabeth (1999). Alexander Graham Bell: An Inventive Life. Toronto, Ontario: Kids Can Press. p. 19. ISBN 978-1-55074-456-9. ^ Bell, Mabel (October 1922). "Dr. Bell's Appreciation of the Telephone Service". Bell Telephone Quarterly. 1 (3): 65. Retrieved September 18, 2015. ^ "National Geographic founders". National Geographic Society. Retrieved January 9, 2014. ^ Howley, Andrew (May 26, 2011). "NGS Celebrates 23rd Founders Day". NGS. National Geographic Society. Retrieved January 18, 2016. Though he wasn't one of the original 33 founders, Bell had a major influence on the Society. ^ Petrie, A. Roy (1975). Alexander Graham Bell. Don Mills, Ontario: Fitzhenry & Whiteside. p. 4. ISBN 978-0-88902-209-6. ^ "Alexander M. Bell Dead. Father of Prof. A. G. Bell Developed Sign Language for Mutes". New York Times. August 8, 1905. Retrieved September 18, 2015. ^ "Call me Alexander Graham Bell". The Franklin Institute. January 14, 2014. Retrieved February 24, 2015. ^ Groundwater, Jennifer (2005). Alexander Graham Bell: The Spirit of Invention. Calgary, Alberta: Altitude Publishing. p. 23. ISBN 978-1-55439-006-9. ^ Bruce 1990, pp. 17–19. ^ a b Bruce 1990, p. 16. ^ a b c Gray 2006, p. 8. ^ Gray 2006, p. 9. ^ Mackay, James (1997). Sounds Out of Silence: A life of Alexander Graham Bell. Edinburgh, UK: Mainstream Publishing. p. 25. ISBN 978-1-85158-833-6. ^ a b Petrie 1975, p. 7. ^ Mackay 1997, p. 31. ^ Gray 2006, p. 11. ^ Town, Florida (1988). Alexander Graham Bell. Toronto, Ontario: Grolier. p. 7. ISBN 978-0-7172-1950-6. ^ Bruce 1990, p. 37. ^ Shulman, Seth (2008). The Telephone Gambit: Chasing Alexander Bell's Secret. New York: Norton & Company. p. 49. ISBN 978-0-393-06206-9. ^ a b c Groundwater 2005, p. 25. ^ Petrie 1975, pp. 7–9. ^ Petrie 1975, p. 9. ^ a b Groundwater 2005, p. 30. ^ Shulman 2008, p. 46. ^ a b c Surtees, Lawrence (2005). 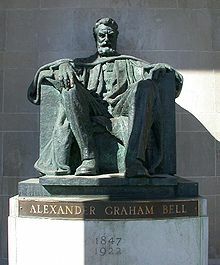 "BELL, ALEXANDER GRAHAM". In Cook, Ramsay; Bélanger, Réal. Dictionary of Canadian Biography. XV (1921–1930) (online ed.). University of Toronto Press. ^ MacKenzie, Catherine (2003) . Alexander Graham Bell. Boston, Massachusetts: Grosset and Dunlap. p. 41. ISBN 978-0-7661-4385-2. ^ Micklos, John Jr. (2006). Alexander Graham Bell: Inventor of the Telephone. New York: HarperCollins. p. 8. ISBN 978-0-06-057618-9. ^ Bruce 1990, p. 45. ^ Bruce 1990, pp. 67–28. ^ Bruce 1990, p. 68. ^ Groundwater 2005, p. 33. ^ Mackay 1997, p. 50. ^ Petrie 1975, p. 10. ^ Gray 2006, p. 21. ^ Mackay 1997, p. 61. ^ Bell Homestead National Historic Site of Canada. Canadian Register of Historic Places. Retrieved September 17, 2015. ^ Wing, Chris (1980). Alexander Graham Bell at Baddeck. Baddeck, Nova Scotia: Christopher King. p. 10. ^ Groundwater 2005, p. 34. ^ Mackay 1997, p. 62. ^ Groundwater 2005, p. 35. ^ Wing 1980, p. 10. ^ Waldie, Jean H. "Historic Melodeon Is Given To Bell Museum". likely published either by the London Free Press or by the Brantford Expositor, date unknown. ^ Bruce 1990, p. 74. ^ Town 1988, p. 12. ^ Alexander Graham Bell ((booklet)). Halifax, Nova Scotia: Maritime Telegraph & Telephone Limited. 1979. p. 8. ^ a b Groundwater 2005, p. 39. ^ Petrie 1975, p. 14. ^ Petrie 1975, p. 15. ^ Town 1988, pp. 12–13. ^ Petrie 1975, p. 17. ^ Schoenherr, Steven E. (February 10, 2000). "Charles Sumner Tainter and the Graphophone". Recording Technology History. Audio Engineering Society. Retrieved September 19, 2015. ^ Hochfelder, David (July 31, 2015). "Alexander Graham Bell". Encyclopædia Britannica. Retrieved September 18, 2015. ^ Miller, Don; Branson, Jan (2002). Damned For Their Difference: The Cultural Construction Of Deaf People as Disabled: A Sociological History. Washington, D.C.: Gallaudet University Press. pp. 30–31, 152–153. ISBN 978-1-56368-121-9. ^ Ayers, William C.; Quinn, Therese; Stovall, David, eds. (2009). The Handbook of Social Justice in Education. London: Routledge. pp. 194–195. ISBN 978-0-80585-928-7. ^ Town 1988, p. 15. ^ Town 1988, p. 16. ^ Toward, Lilias M. (1984). Mabel Bell: Alexander's Silent Partner. Toronto, Ontario: Methuen. p. 1. ISBN 978-0-458-98090-1. ^ Eber, Dorothy Harley (1991) . Genius at Work: Images of Alexander Graham Bell (reprint ed.). Toronto, Ontario: McClelland and Stewart. p. 43. ISBN 978-0-7710-3036-9. ^ Dunn, Andrew (1990). Alexander Graham Bell. (Pioneers of Science). East Sussex, UK: Wayland Publishers. p. 20. ISBN 978-1-85210-958-5. ^ "Alexander Graham Bell and Thomas Watson". CBC. July 25, 1975. Retrieved October 14, 2016. ^ Matthews, Tom L. (1999). Always Inventing: A Photobiography of Alexander Graham Bell. Washington, D.C.: National Geographic Society. pp. 19–21. ISBN 978-0-7922-7391-2. ^ Matthews 1999, p. 21. ^ Carroll, Rory (June 17, 2002). "Bell did not invent telephone, US rules". the Guardian. Retrieved on September 20, 2018. ^ McCormick, Blaine; Israel, Paul (January–February 2005). "Underrated entrepreneur: Thomas Edison's overlooked business story". IEEE Power & Energy Magazine. 3 (1): 76–79. doi:10.1109/MPAE.2005.1380243. Archived from the original on December 23, 2009. ^ Town 1988, p. 17. ^ Evenson, A. Edward (2000). The Telephone Patent Conspiracy of 1876: The Elisha Gray — Alexander Bell Controversy. Jefferson, North Carolina: McFarland Publishing. pp. 18–25. ISBN 978-0-7864-0883-2. ^ Fitzgerald, Brian (September 14, 2001). "Alexander Graham Bell: The BU Years". B.U. Bridge. V (5). Boston University. Retrieved March 28, 2010. ^ Bruce 1990, p. 291. ^ Bruce 1990, pp. 158–159. ^ MacLeod 1999, pp. 12–13. ^ "Alexander Graham Bell - Lab notebook pp. 40–41 (image 22)". American Treasures. Library of Congress. Retrieved July 28, 2010. ^ MacLeod 1999, p. 12. ^ Evenson 2000, p. 99. ^ Evenson 2000, p. 98. ^ "Mr. Wilbur "confesses"". The Washington Post. May 22, 1886. p. 1. ^ MacLeod 1999, p. 14. ^ Fenster, Julie M. (March 7, 2006). "Inventing the Telephone—And Triggering All-Out Patent War". American Heritage. Archived from the original on March 11, 2006. Retrieved September 19, 2015. ^ Winfield, Richard (1987). Never the Twain Shall Meet: Bell, Gallaudet, and the Communications Debate. Washington, D.C.: Gallaudet University Press. p. 21. ISBN 978-0-913580-99-8. ^ Webb, Michael, ed. (1991). Alexander Graham Bell: Inventor of the Telephone. Mississauga, Ontario: Copp Clark Pitman. p. 15. ISBN 978-0-7730-5049-5. ^ Ross, Stewart (2001). Alexander Graham Bell. (Scientists who Made History). New York: Raintree Steck-Vaughn. pp. 21–22. ISBN 978-0-7398-4415-1. ^ "Dom Pedro II and America". The Library of Congress. Retrieved March 7, 2018. ^ "Phone to Pacific From the Atlantic". The New York Times. January 26, 1915. Retrieved July 21, 2007. ^ MacLeod 1999, p. 19. ^ "Who Really Invented The Telephone?". Australasian Telephone Collecting Society. Moorebank, NSW, Australia. Retrieved April 22, 2011. ^ a b c Groundwater 2005, p. 95. ^ Black, Harry (1997). Canadian Scientists and Inventors: Biographies of People who made a Difference. Markham, Ontario: Pembroke. p. 19. ISBN 978-1-55138-081-0. ^ Mackay 1997, p. 179. ^ "US v. AMERICAN BELL TEL CO, (1897)". Findlaw. May 10, 1897. Retrieved July 28, 2010. ^ "United States V. American Bell Telephone Co., 128 U.S. 315 (1888)". Jusrtia US Supreme Court. November 12, 1885. Retrieved July 28, 2010. ^ Catania, Basilio (December 2002). "The United States Government vs. Alexander Graham Bell. An important acknowledgment for Antonio Meucci" (PDF). Bulletin of Science, Technology & Society. 22 (6): 426–442. doi:10.1177/0270467602238886. Retrieved December 29, 2009. (Subscription required (help)). ^ Catania, Basilio (November 6, 2009). "Antonio Meucci – Questions and Answers: What did Meucci to bring his invention to the public?". Chezbasilio.org. Retrieved September 19, 2015. ^ "Our History". ADT. Retrieved September 18, 2015. ^ Bruce 1990, pp. 271–272. ^ Rory Carroll (June 17, 2002). "Bell did not invent telephone, US rules". The Guardian. Retrieved October 25, 2015. ^ "Congressional Record – Speech by Prof. Basillio". September 5, 2001. Archived from the original on July 17, 2011. Retrieved September 18, 2015. ^ "Antonio Meucci (1808–1889)". 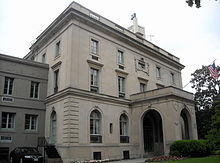 Italian Historical Society of America. Retrieved September 18, 2015. ^ a b Bellis, Mary. "The History of the Telephone – Antonio Meucci". About.com Inventors. Retrieved December 29, 2009. ^ Mackay 1997, p. 178. ^ Parker, Steve (1995). Alexander Graham Bell and the Telephone. Scientific American. (Science Discoveries). 102. p. 23. Bibcode:1910SciAm.102..462.. doi:10.1038/scientificamerican06041910-462. ISBN 978-0-7910-3004-2. ^ Bruce 1990, pp. 297–299. ^ Eber 1991, p. 44. ^ Dunn 1990, p. 28. ^ Mackay 1997, p. 120. ^ "Dr. Gilbert H. Grosvenor Dies". The New York Times. Canadian Press. February 5, 1966. Retrieved September 18, 2015. (Subscription required (help)). Dr. Gilbert H. Grosvenor ... died on the Cape Breton Island estate once owned by his father-in-law, the inventor Alexander Graham Bell. ^ "Mrs. Gilbert Grosvenor Dead". The New York Times. December 27, 1964. Retrieved September 18, 2015. ^ Grosvenor, Edwin S.; Wesson, Morgan (1997). Alexander Graham Bell: The Life and Times of the Man Who Invented the Telephone. New York: Harry N. Abrahms. p. 104. ISBN 978-0-8109-4005-5. ^ "Mrs. David Fairchild, 82, Dead; Daughter of Bell, Phone Inventor". The New York Times. Canadian Press. September 25, 1962. (Subscription required (help)). ^ a b Grosvenor & Wesson 1997, p. 104. ^ Carson, Mary Kay (2007). Alexander Graham Bell: Giving Voice To The World. Sterling Biographies. New York: Sterling Publishing. p. 77. ISBN 978-1-4027-3230-0. OCLC 182527281. ^ Gray 2006, pp. 202–205. ^ Bruce 1990, p. 90. ^ Bruce 1990, pp. 471–472. ^ Bethune, Jocelyn (2009). Historic Baddeck. (Images of our Past). Halifax, Nova Scotia: Nimbus Publishing. p. 2. ISBN 978-1-55109-706-0. ^ Bethune 2009, p. 92. ^ a b c Bethune 2009, p. 2. ^ Tulloch, Judith (2006). 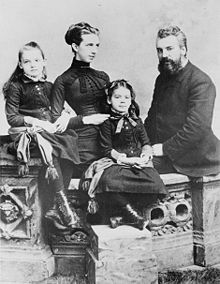 The Bell Family in Baddeck: Alexander Graham Bell and Mabel Bell in Cape Breton. Halifax, Nova Scotia: Formac Publishing. pp. 25–27. ISBN 978-0-88780-713-8. ^ MacLeod 1999, p. 22. ^ Tulloch 2006, p. 42. ^ Gray 2006, p. 219. ^ Bruce 1990, p. 336. ^ Jones, Newell (July 31, 1937). "First 'Radio' Built by San Diego Resident Partner of Inventor of Telephone: Keeps Notebook of Experiences With Bell". Evening Tribune. San Diego, California. Archived from the original on February 19, 2002. Retrieved November 26, 2009. ^ Carson 2007, pp. 76–78. ^ Bruce 1990, p. 338. ^ Groth, Mike (April 1987). "Photophones Revisted". Amateur Radio: 12–17. Archived from the original on August 2, 2015. Retrieved September 19, 2015. ^ Mims III, Forest M. (February 10–26, 1982). "The First Century of Lightwave Communications". Fiber Optics Weekly Update: 11 of 6–23. ^ Phillipson, Donald J.C.; Neilson, Laura (March 4, 2015). "Alexander Graham Bell". The Canadian Encyclopedia (online ed.). Historica Canada. Retrieved September 19, 2015. ^ Morgan, Tim J. (2011). The Fiber Optic Backbone (Report). University of North Texas. Archived from the original on September 25, 2015. Retrieved September 19, 2015. ^ Miller, Stewart E. (January–February 1984). "Lightwaves and Telecommunication". American Scientist. 72 (1): 66–71. JSTOR i27852430. ^ a b c Grosvenor & Wesson 1997, p. 107. ^ Bell, Alexander Graham (1882). "Upon the electrical experiments to determine the location of the bullet in the body of the late President Garfield; and upon a successful form of induction balance for the painless detection of metallic masses in the human body". American Journal of Science. 25 (145): 22–61. Bibcode:1883AmJS...25...22B. doi:10.2475/ajs.s3-25.145.22. Retrieved April 29, 2013. ^ Boileau 2004, p. 18. ^ Boileau 2004, pp. 28–30. ^ Boileau 2004, p. 30. ^ "Nova Scotia's Electric Scrapbook." Archived April 17, 2009, at the Wayback Machine ns1763.ca. Retrieved: December 29, 2009. ^ Gillis, Rannie (September 29, 2008). "Mabel Bell Was A Focal Figure In The First Flight of the Silver Dart". Cape Breton Post. Sydney, Nova Scotia. Archived from the original on July 24, 2016. Retrieved June 12, 2010. ^ "Canada's Golden Anniversary". Flight. Vol. 75 no. 2614. February 27, 1959. p. 280. Retrieved August 28, 2013. ^ Phillips, Allan (1977). Into the 20th Century: 1900/1910. (Canada's Illustrated Heritage). Toronto, Ontario: Natural Science of Canada. p. 95. ISBN 978-0-919644-22-9. ^ Phillips 1977, p. 96. ^ "Link with Canadian Pioneers". Flight. Vol. 70 no. 2491. October 19, 1956. p. 642. Retrieved August 28, 2013. ^ Bell, Alexander Graham (1883). Memoir: Upon the Formation of a Deaf Variety of the Human Race (PDF). National Academy of Sciences. ^ Bruce 1990, pp. 410–417. ^ Lusane, Clarence (2003). Hitler's Black Victims: The Historical Experiences of Afro-Germans, European Blacks, Africans, and African Americans in the Nazi Era. Hove, East Sussex, UK: Psychology Press. p. 124. ISBN 978-0-415932-950. ^ Ireland, Carolyn (February 27, 2009). "The Portrait Studio House". The Globe and Mail. ^ "Daughter Unveils Inventor's Statue: Bronze Figure Is Dedicated By Phone Pioneers". Brantford Expositor. June 18, 1949. ^ a b "About this Collection". Alexander Graham Bell Family Papers. Library of Congress. Retrieved September 18, 2015. ^ Osborne, Harold S. (1943). Biographical Memoir of Alexander Graham Bell 1847–1922 (PDF). Biographical Memoirs. Vol. XXIII. National Academy of Sciences. p. 18. Retrieved September 18, 2015. ^ "Alexander Graham Bell National Historic Site". Parks Canada. August 7, 2015. Archived from the original on October 11, 2007. Retrieved September 18, 2015. ^ "Pay Us a Call at Melville House!". Bell Homestead National Historic Site. Retrieved September 18, 2015. ^ "Alexander Graham Bell Memorial Park." maps.google.com. Retrieved: February 14, 2012. ^ a b c d e "Dr. Bell, Inventor of Telephone, Dies" (PDF). The New York Times. August 3, 1922. Retrieved March 3, 2009. ^ "Honors to Professor Bell Daily Evening Traveller". Alexander Graham Bell Family Papers. Library of Congress. September 1, 1880. Retrieved September 18, 2015. ^ "Volta Prize of the French Academy Awarded to Prof. Alexander Graham Bell". Alexander Graham Bell Family Papers. Library of Congress. September 1, 1880. Retrieved September 18, 2015. ^ "Telegram from Grossman to Alexander Graham Bell". Alexander Graham Bell Family Papers. Library of Congress. August 2, 1880. Retrieved September 18, 2015. ^ "Telegram from Alexander Graham Bell to Count du Moncel, undated". Alexander Graham Bell Family Papers. Library of Congress. 1880. Retrieved September 18, 2015. ^ "Letter from Frederick T. Frelinghuysen to Alexander Graham Bell". Alexander Graham Bell Family Papers. Library of Congress. January 7, 1882. Retrieved September 18, 2015. ^ "The Volta Prize For Electricity". Selected Innovation Prizes and Reward Programs (PDF) (Report). Knowledge Ecology International. 2008. p. 16. Retrieved September 18, 2015. ^ Maindron, Ernest (1881). Gauthier-Villars, ed. Les fondations de prix à l'Académie des sciences : les lauréats de l'Académie, 1714-1880 (in French). 1. pp. 131–133. ^ Davis, John L. (July 1998). "Artisans and savants: The Role of the Academy of Sciences in the Process of Electrical Innovation in France, 1850–1880". Annals of Science. 55 (3): 291–314. doi:10.1080/00033799800200211. ^ "Letter from Mabel Hubbard Bell". Alexander Graham Bell Family Papers. Library of Congress. February 27, 1880. Retrieved September 18, 2015. The last line of the typed note refers to the future disposition of award funds: He intends putting the full amount into his Laboratory and Library. ^ "National Geographic Milestones". National Geographic Milestones. National Geographic Society. June 20, 2012. Retrieved January 18, 2016. ^ "Proceedings of the Board of Regents of the Smithsonian Institution at the Annual Meeting held December 14, 1922", Volume IV of the Proceedings of the Board of Regents, Dec. 9, 1920 - Dec. 10, 1931, Washington, D. C.: Smithsonian Institution, December 14, 1922, p. 547, RESOLVED: That the Executive Committee be requested to prepare a memorial commemorative of the life and work of Dr. Alexander Graham Bell, Regent of the Smithsonian Institution from 1898 to 1922, said memorial to be presented at the next Annual Meeting of the Board. ^ "Alexander Graham Bell". Engineering and Technology History Wiki. Retrieved September 18, 2015. ^ "Decibel." Archived August 9, 2017, at the Wayback Machine sfu.ca. Retrieved: July 28, 2010. ^ "bel". The American Heritage Dictionary of the English Language (Fifth ed.). Houghton Mifflin Harcourt. 2011. Retrieved September 18, 2015. ^ Beauchamp, Christopher (October 2010). "Who Invented the Telephone? : Lawyers, Patents, and the Judgments of History". Technology and Culture. 51 (4): 854–878. doi:10.1353/tech.2010.0038 (inactive 2019-01-28). ^ "Royal Bank Commemorative Notes". Rampant Scotland. Retrieved October 14, 2008. ^ "Proof Set - 100th Anniversary of Flight in Canada (2009)". Royal Canadian Mint. Retrieved September 18, 2015. ^ "100 great British heroes". BBC News World Edition. August 21, 2002. Retrieved April 5, 2010. ^ "Alexander Graham Bell (1847–1922)". Scottish Science Hall of Fame. 2009. ^ MacDougall, D., ed. (1917). "Part V: Alexander Graham Bell". Scots and Scots Descendant in America. New York: Caledonian. p. 162. Retrieved September 18, 2015. ^ a b c d e f g h i j k l MacDougall 1917, p. 162. ^ "Honorary Degree Recipients". Gallaudet University. Washington, DC. Archived from the original on June 18, 2010. Retrieved July 28, 2010. ^ "Honorary Degrees Conferred". Illinois College. Archived from the original on September 24, 2015. Retrieved September 18, 2015. ^ "Graduations". University of Edinburgh. Archived from the original on September 1, 2015. Retrieved September 18, 2015. ^ "Dartmouth graduates 208: Alexander Graham Bell Among Those Receiving Honorary Degrees" (PDF). The New York Times. July 26, 1913. Retrieved July 30, 2009. ^ "THE SCREEN; The founding of the Wrong-Number Industry WellDramatized in Roxy's 'Alexander Graham Bell' At the 86th St. Garden Theatre At Three Theatres At the 86th Street Casino". The New York Times. April 1, 1939. Retrieved February 2, 2017. ^ Gray, Charlotte (2006). Reluctant Genius: The Passionate Life and Inventive Mind of Alexander Graham Bell. New York: Arcade. p. 419. ISBN 978-1-55970-809-8. ^ Gray 2006, p. 418. ^ Bethune 2009, p. 95. ^ Duffy, Andrew (February 23, 2009). "The Silver Dart sputtered into history". Ottawa Citizen. Archived from the original on July 13, 2015. Retrieved September 18, 2015. .
^ Bethune 2009, p. 119. ^ Bruce 1990, p. 491. ^ Bethune 2009, pp. 119–120. ^ Osborne 1943, pp. 18–19. Bell, Alexander Graham (October 1880). "On the Production and Reproduction of Sound by Light". American Journal of Science (Read before the American Association for the Advancement of Science, in Boston, August 27, 1880). Third. 20 (118): 305–324. Bibcode:1880AmJS...20..305B. doi:10.2475/ajs.s3-20.118.305. Also published as: Bell, Alexander Graham (September 23, 1880). "Selenium and the Photophone" (PDF). Nature. 22 (569): 500–503. Bibcode:1880Natur..22..500.. doi:10.1038/022500a0. This page was last edited on 16 April 2019, at 03:40 (UTC).